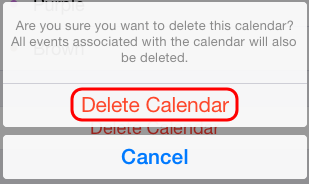 The following document explains how to delete an existing calendar using an iOS device (iPhone, iPad, or iPod Touch). 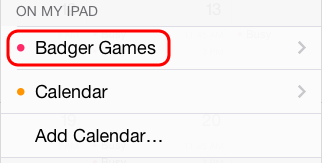 In iPhone Calendar, tap on the Calendars button at the bottom-middle of the iPhone Calendar display. Tap on the Edit button at the top-left of the Calendars display. Tap on the calendar you wish to delete. Scroll to reveal the Delete Calendar button at the bottom of the Edit Calendar display and tap on it. 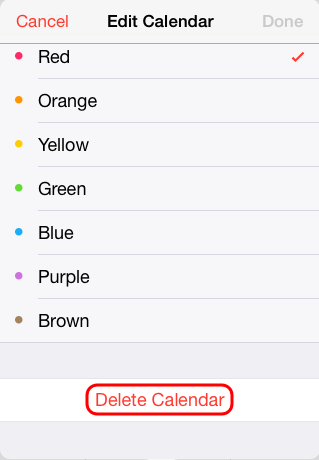 Confirm the deletion by tapping on Delete Calendar in the confirmation display. Tap Done at the top-left of the Edit Calendars display. Tap Done at the top-left of the Calendars display to return to the main display.